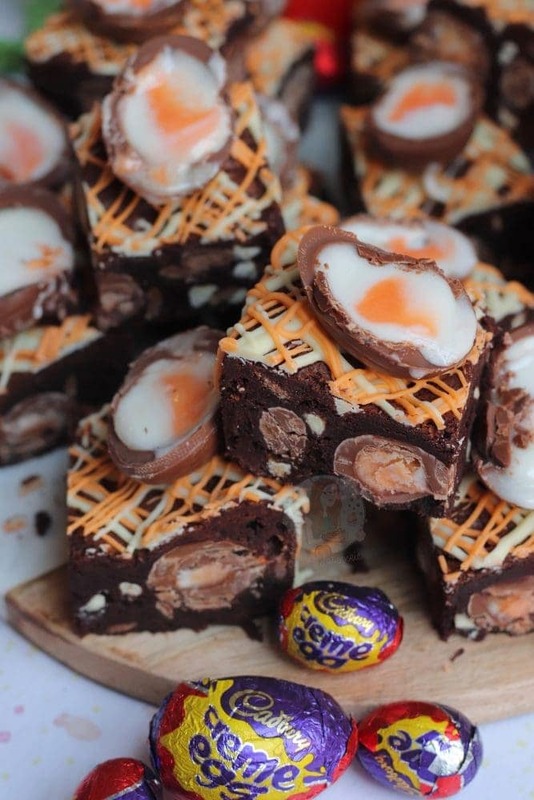 Super Chocolatey and Delicious Creme Egg Brownies, with Chocolate Chips, even more Chocolate, and Creme Eggs inside and out! 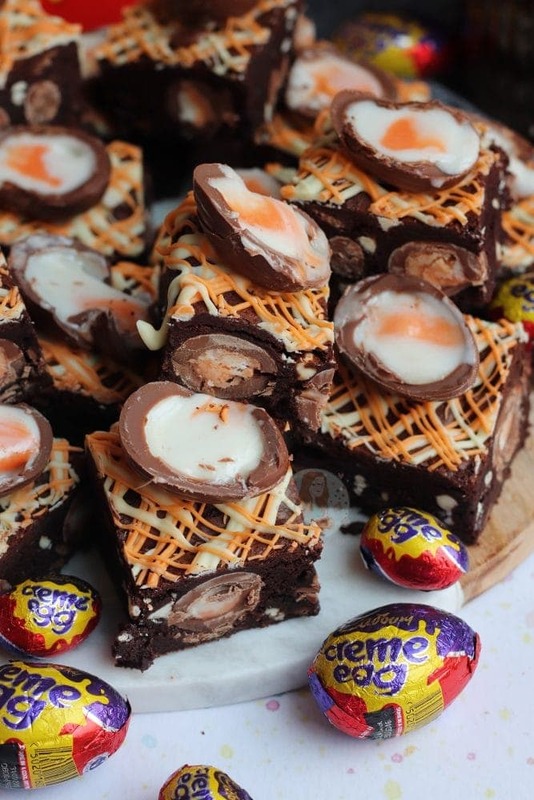 Today is the day, where I post my version of the ever so popular and Easter baking craze… Creme Egg Brownies. I will say from the start that I am OBSESSED with these, and Creme Eggs aren’t my first choice for an Easter Treat! I am not insulting Creme Eggs in saying that, I am just full on Mini Egg OBSESSED. 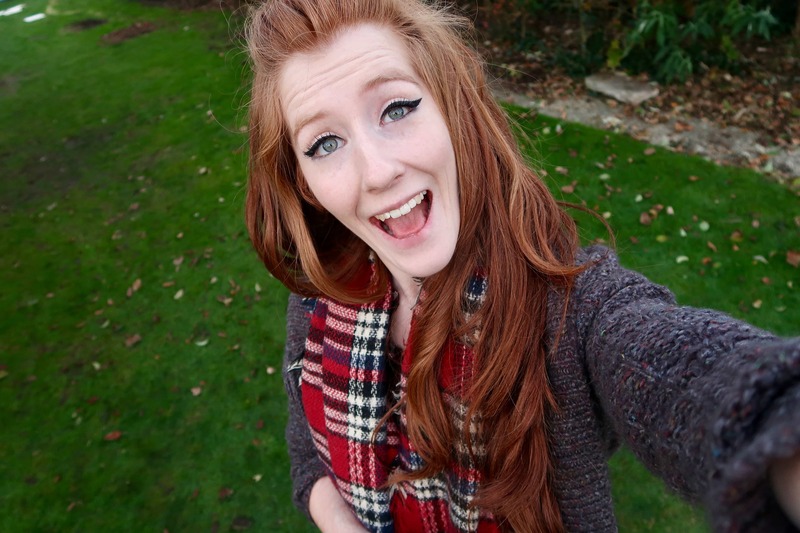 However, these beauties… oh my actual days. As I have baked these a few times for myself, I thought I would post them onto here, as I have had several requests over the years! 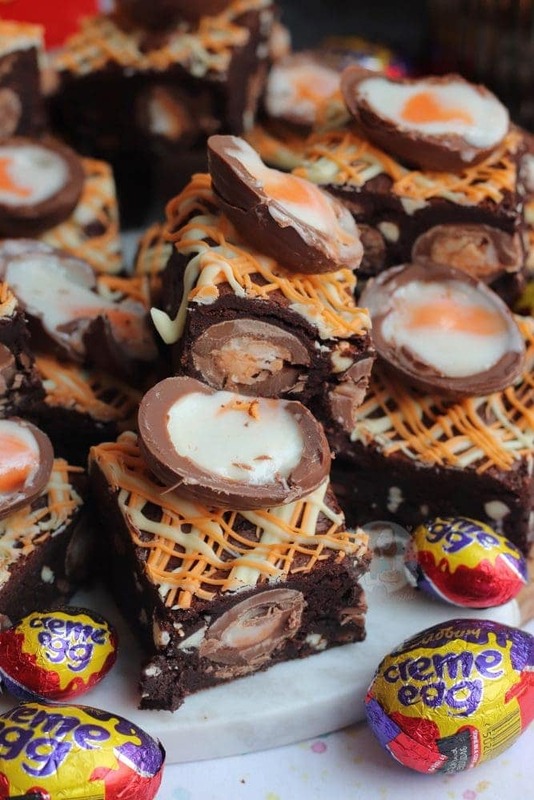 I will obviously say that I didn’t invent the idea of Creme Egg brownies, as when you google ‘Creme Egg’ one of the first ‘hints’ that comes up underneath is Creme Egg Brownies. So… yeah. They’re so very popular. Either way, I wanted a stab at it, and these are deeeelightful. These are ever so slightly different to my Triple Chocolate Brownies as I wanted the batter to be a smidge thicker. I didn’t want all of the chocolate chips to sink through, and for the Creme Eggs to spoil during the baking of the Brownies. 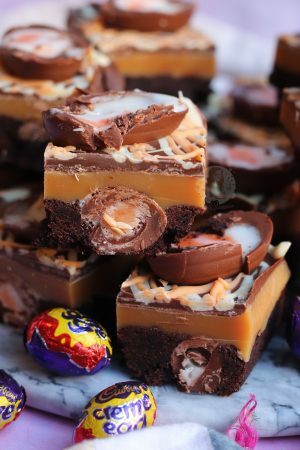 My Creme Egg Cheesecake has always been a popular choice amongst my readers, and my Creme Egg Cookie Bars being a good alternative to the Creme Egg Brownies that so many of you have already desired! I know that everyone will love these, as they have already become my Fiancé’s favourite recipe of mine! 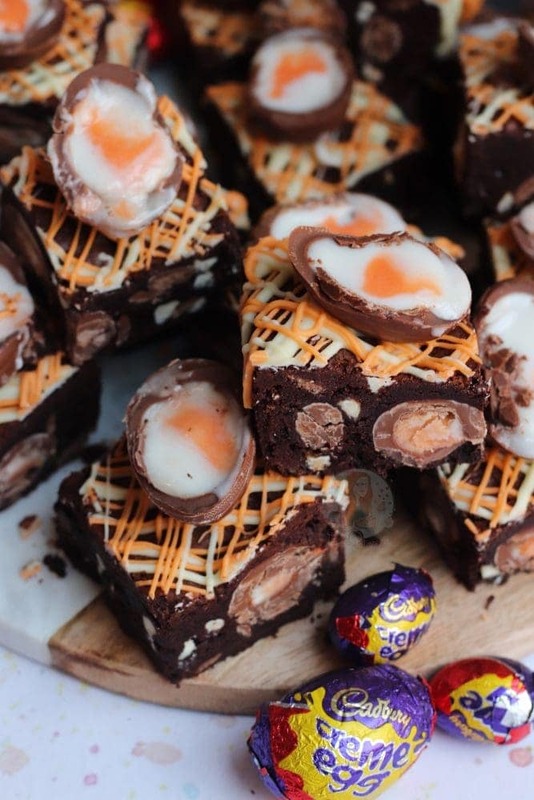 Most of the time with Creme Egg Brownies, they’re usually a chocolate brownie, with half an egg baked into the top, or put on the top within the last couple of minutes. 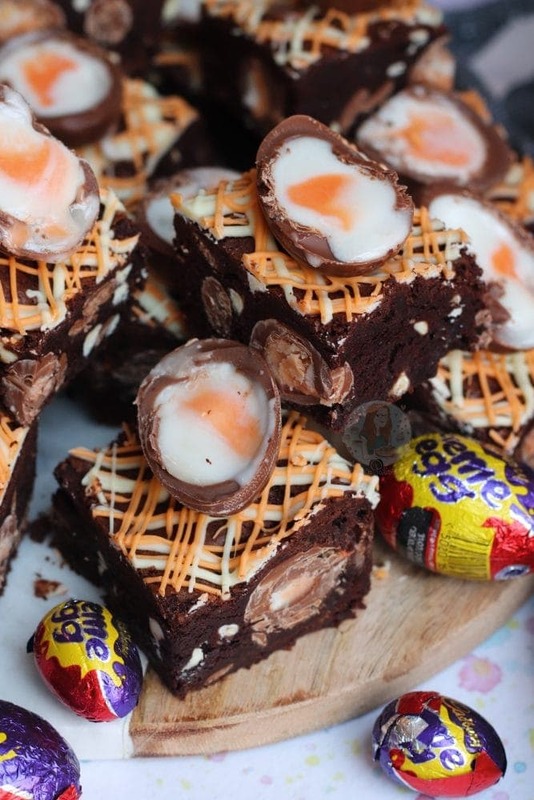 I do love these, however, I wanted mine to be a little bit more Creme Egg themed! 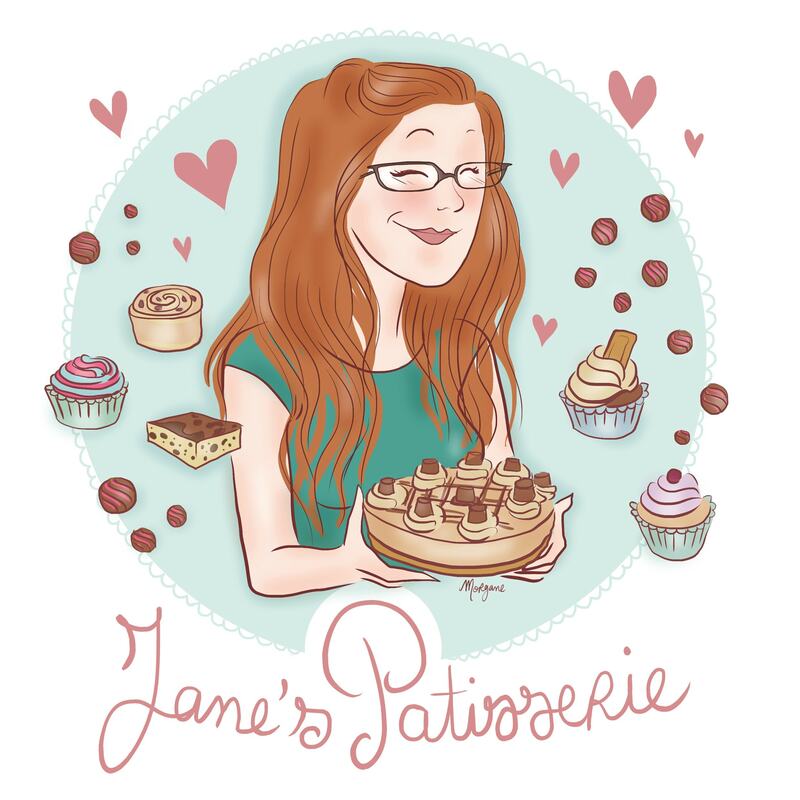 We all know what I am like with a theme anyway… I love to go overboard with whatever chocolate the bake is based around. I think I am quite contained lately, but these do use 3x bags of the Mini Creme Eggs, and 8 regular Creme Eggs… so it’s still quite a bit. 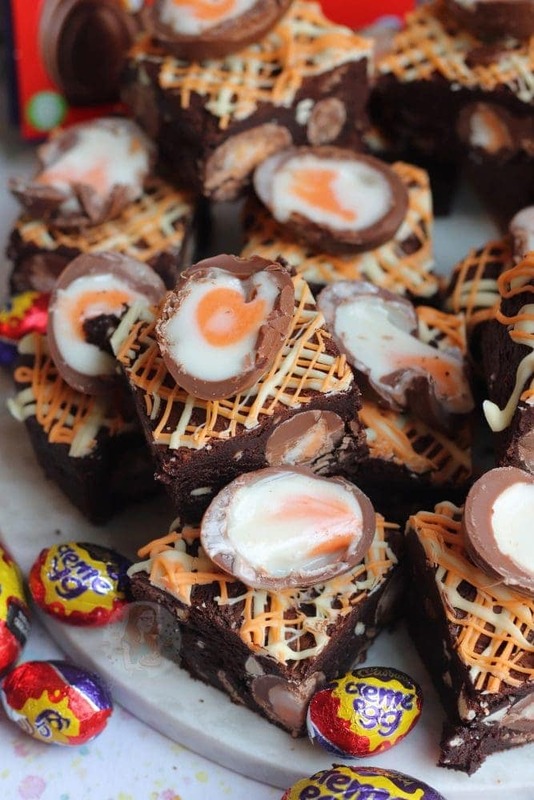 One very important part of this recipe, is to FREEZE THE MINI CREME EGGS. I do this overnight, as it makes my life much easier, and it means they are definitely completely solid. A better tip is to remove the foil before you freeze them, so they can go straight into the bake without thawing too much. The other important tip, is to be gentle with the Brownie mix. The theory behind this is explained in my Triple Chocolate Brownies post – but to put it quickly… whisk your eggs and sugar until they are REALLY thick and mousse, and when fold through your DARK CHOCOLATE and butter mix(not milk chocolate.. please not milk), flour and cocoa powder, be as gentle as possible. 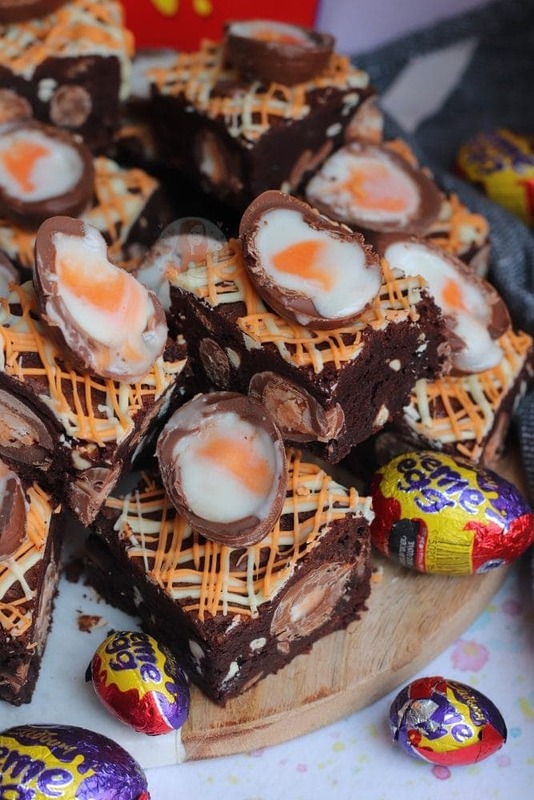 So, after having plugged three bags of Mini Creme Eggs into the brownies to make sure every slice has as much Creme Egg as possible, along with some chocolate chips for some gooeyness, I went a little further. Drizzling chocolate on top. 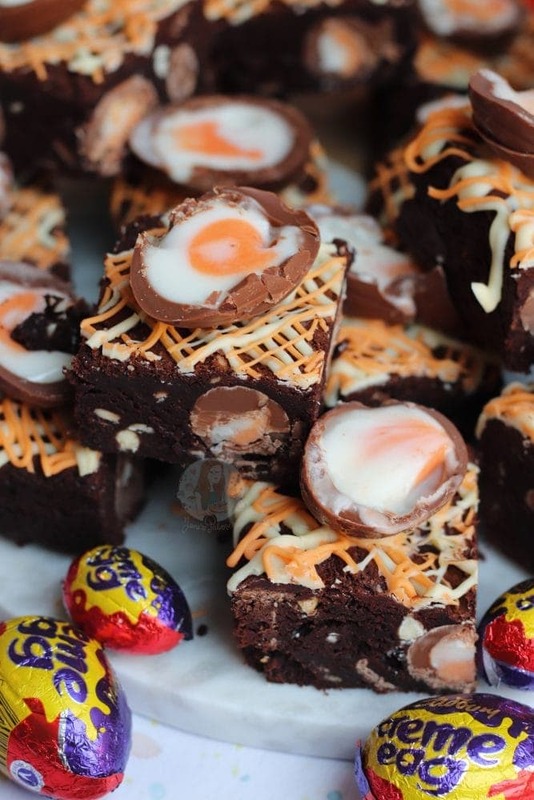 I nearly always drizzle chocolate on top of treats – such as my Malteser Brownies! I think it takes the bake to a new level, and it also looks good! This time I went for White Chocolate colour to be orange for half of it, like in my Creme Egg Millionaires Shortbread! To finish it off, a classic halved Creme Egg on top was ideal. I find it easier to chop these when they’re chilled – but each to their own. A sharp knife also helps – but cut along the line of the Creme Egg where there is a split. Stick on using the melted chocolate and once set you can enjoy something incredible! Using an electric whisk/stand mixer, whisk together the Eggs & Caster Sugar for a few minutes until the colour has turned pale, is very mousse like, and is double the original volume of the amount of Eggs + Sugar! When whisked, pour the cooled Chocolate mix over the Eggs mixture and fold together carefully. It might take some time, but be patient – you don’t want to knock out the air you made up on the previous step! 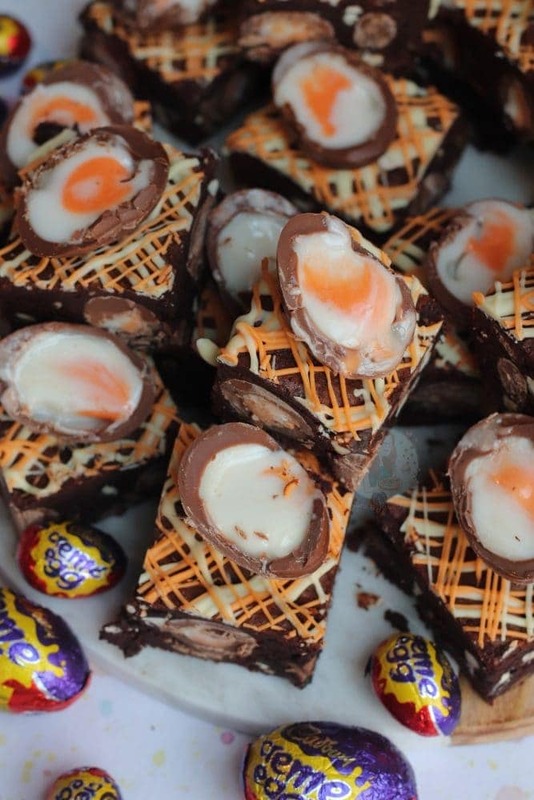 Once combined well, fold through the chocolate chips and the FROZEN Mini Creme Eggs and pour into the prepared tin – bake in the oven for 25-30+ minutes! Once baked, leave to cool in the tin completely. Once cooled - melt your White Chocolate till smooth. Split it into two, and colour one to a lighter orange colour. 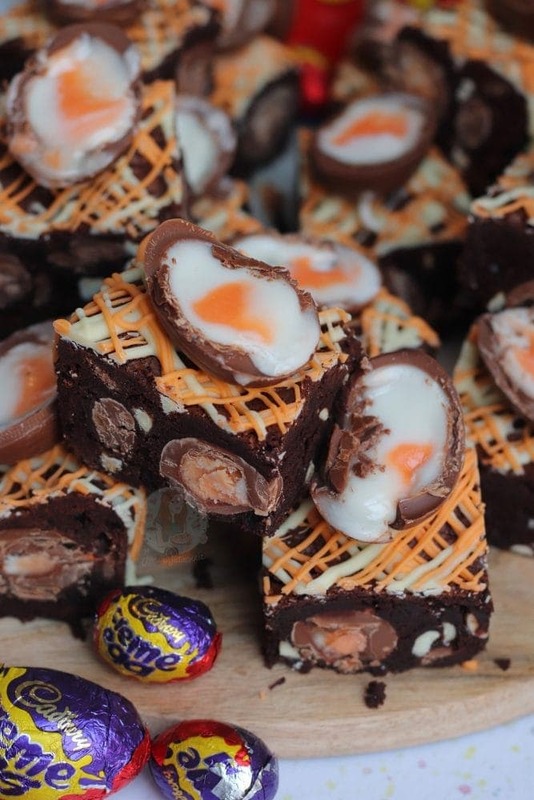 Drizzle both over the Brownies - and add on 16 halves of Creme Eggs - so one for each piece! Leave to set on the side, or in the fridge till the chocolate is set so it's easier to cut. Enjoy! These Brownies will last in an airtight container for 1 week! If you find they're a bit hard to cut, stick them in the fridge for an hour and it'll make it a lot easier! They should be done when they're not wobbling when you shake the tin, and a skewer should come out mostly clean, not covered in chocolate. I use THIS 9" Square Tin in this Recipe! 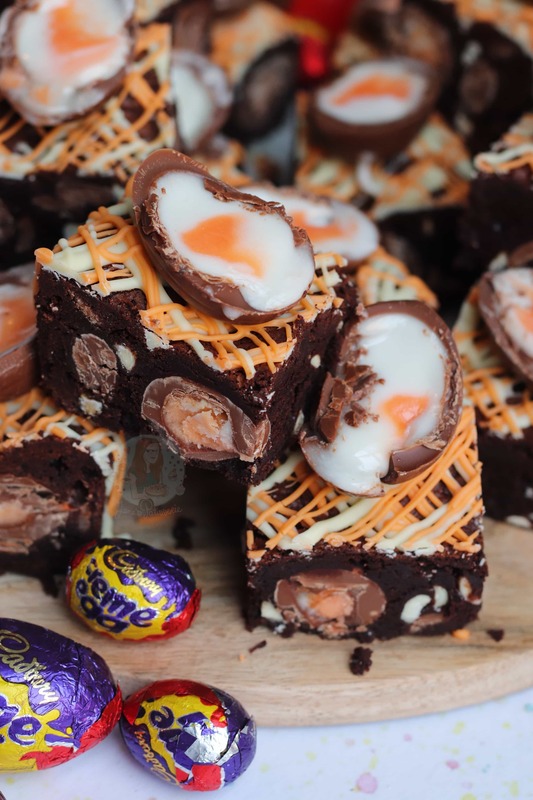 The Creme Eggs should be absolutely fine in the brownies, but if your brownies have to stay in for much longer than the time stated, they might start to char if they're 'on show' in the oven/the creme filling might disappear slightly. It's VERY IMPORTANT to FREEZE your Creme Eggs to help prevent any issues! 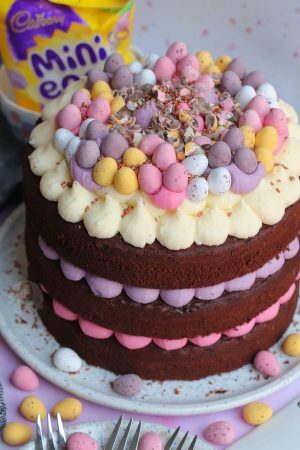 Older Next post: Mini Egg Chocolate Cake! 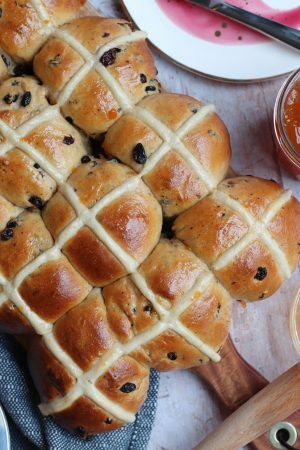 Newer Previous post: Hot Cross Buns! Just started to bake, I’m a newbie to this world. 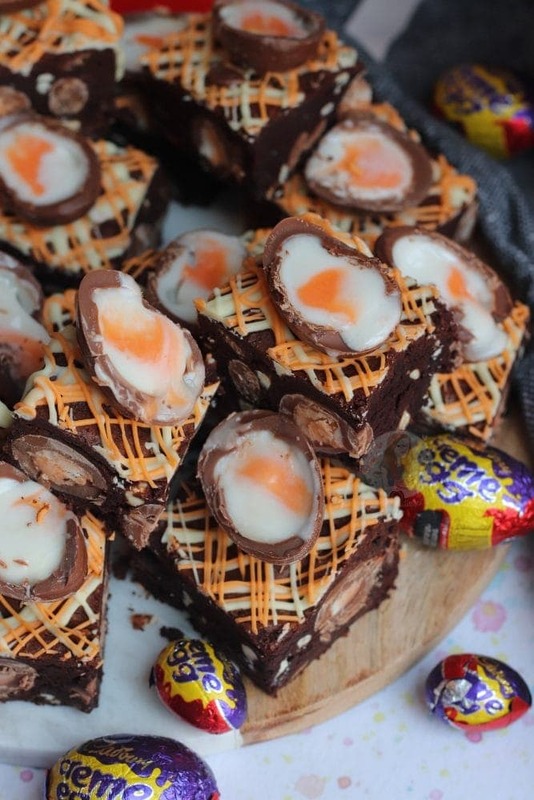 I tried your Eton mess cheesecake, delicious & now I want to try this, creme egg brownies. 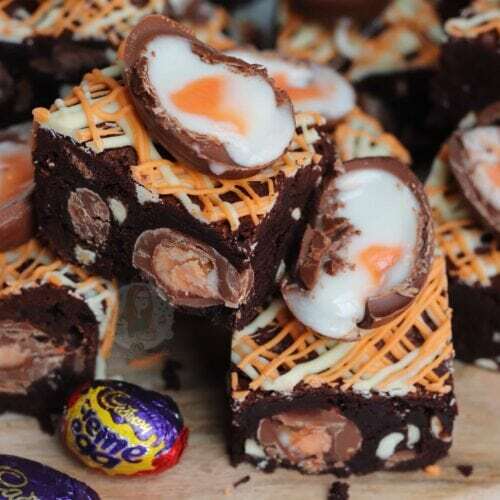 I cant seem to find small bags of creme eggs here in Ireland so how many creme eggs should I use in the mix & do I chop them or half, quater them in the mix? Thanks.